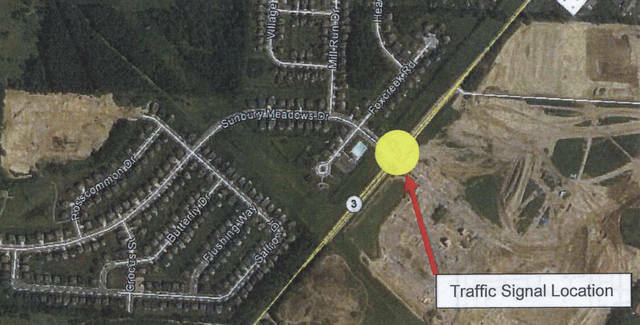 Early fall appears to be the revised installation date for a traffic signal at Sunbury Meadows Drive and State Route 3. Sunbury’s Village Council unanimously approved event dates for the Big Walnut Civic Association at its meeting Wednesday night, April 4. Those events include the Chief’s Champions Fun Run and 5K for retired BST&G Fire Chief Jeff Wilson (May 5); the Eagle Dash in Freedom Park (May 20); four Movie Nights (June 9, July 14, July 28, Aug. 11); Sunbury Sizzle and Sounds (Aug. 18); and the Big Nut Strut (Sept. 23). The Civic Association also puts on the village’s July 4th Celebration, with events from 7 a.m. to 3 p.m. on the Square; and evening events at Big Walnut High School. “We’re the only real fireworks display in the northeast corner of Delaware County,” said Cindy Erndt from the Civic Association, referring to Sunbury. Police Chief Robert Howard discussed an initiative to have the officers look more professional with upgraded uniforms this summer; putting a new cruiser into service in the coming week; and swapping the department’s Keltec semi-automatic rifles for AR semi-automatic shotguns with Vance Outdoors. Howard said the all officers are qualified with AR training, so council approved the swap. Administrator Allen Rothermel said a full-time maintenance worker for the Street Department has been hired, and a full-time maintenance position at the Waste Water Treatment Plant was posted. The plant has received more than 3 inches of rain since Monday. Residents may have seen workers from MP Dory at Sunbury Meadows Drive and State Route 3 on Monday, April 2. They were doing prep work at the corners for installation of a traffic light, but engineering staff said there was no change on when the signal is going in. https://www.delgazette.com/wp-content/uploads/sites/40/2018/04/web1_sunbury-meadows.jpegEarly fall appears to be the revised installation date for a traffic signal at Sunbury Meadows Drive and State Route 3.